Sorbothane® has a superior damping coefficient, over a very wide temperature range, compared to any other polymer. Sorbothane’s operating temperature range is -20° to +160° Fahrenheit (-29° to 72° Celsius). Unlike fluid-based shock absorbers or foam products, Sorbothane® absorbs shocks efficiently for millions of cycles. Sorbothane® eliminates the need for metal springs to return the system to its equilibrium position after absorbing a shock. That's right - Sorbothane® can prevent a raw egg from being smashed. Watch as David Church, President of Sorbothane, Inc. and Lisa Eitel, Editor at Design World perform the egg smash test. This demonstration proves Sorbothane's ability to protect delicate components and safeguard product performance by attenuating shock and isolating vibration. Visco-elastic refers to any material that exhibits properties of both liquids (viscous solutions) and solids (elastic materials). Because visco-elastic behavior is desirable in shock and vibration applications, many materials claim to be so. Technically, they're correct, but only because they have trace "visco-elastic" properties. A viscous (liquid) material deforms under load and transmits forces in all directions. It distributes a small amount of pressure over a large area, and doesn't recover its shape when a load is removed. An elastic material deforms under load and returns to its original shape when that load is removed. What is a damping coefficient? A damping coefficient is a material property that indicates whether a material will "bounce back" or return energy to a system. For example, since a basketball has a good bounce back, it has a low damping coefficient. If the bounce is caused by an unwanted vibration or shock, a high damping coefficient will attenuate the response – essentially "swallowing" the energy and reducing the reaction of the system. Where does 'swallowed' energy go in Sorbothane®? It's converted into a small amount of heat. How efficient is Sorbothane® as a shock absorber? Depending upon the application, Sorbothane® can absorb up to 94.7 percent of shock energy. How efficient is Sorbothane® as a vibration damper? Sorbothane® can absorb over 50 percent of vibration energy over most of its temperature operating range at frequencies from 10 to 30,000 hertz. 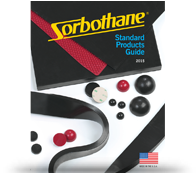 You can purchase Sorbothane® with a fire retardant that allows it to meet the Underwriters Laboratory 94 V2 standard. Generally, Sorbothane® has a very high chemical resistance similar to other polyurethanes. However, we'd recommend avoiding the following chemicals with its use: gasoline, alcohol and plastics solvents. What are vibration isolators and dampers? A good vibration isolator lowers the natural frequency of a system to below the excitation (or disturbing) frequency. Keeping these two frequencies "out-of-sync" greatly reduces vibration problems. A good vibration damper takes mechanical energy out of the system. Properly-designed metal springs and rubber mounts can be good isolators, but have almost no damping capability. Oil dampers (dashpots) have good damping capability, but no isolation capability. Foam products can be good isolators, but have limited life. What should I look for in a vibration damper? The tangent of delta is a dimensionless term that expresses the out-of-phase time relationship between a shock impact or vibration and the transmission of the force to the support. It can also be known as tan delta, the damping coefficient, or the loss factor. Generally, the higher the tangent of delta, the better the material performance with regards to shock and vibration. Different experts use different formulas for these terms, but they're fairly interchangeable. See What is the "tangent of delta?" Durometer is a measure of hardness used for polymers. A higher durometer is a frequent indicator of a stronger material and, potentially, other properties. Sorbothane® is softer than rubber and most other polymers. It's normally measured on the Shore "00" scale. Most types of rubber and other polymers are specified using the Shore "A" or Shore "D" scales. In comparing hardness, be aware of the scale being used for the material in question. Hardness values listed on the adjacent table are approximate, and should only be used as a durometer selection guide. What durometers of Sorbothane® are available? Sorbothane® parts are normally cast between 30 and 70 durometer on the Shore "00" scale. For special applications (at increased cost), Sorbothane® can be cast as low as 20 durometer (limited strength) and as high as 80 durometer (limited visco-elastic properties).